A hearing on the motion to dismiss is scheduled for January 20, 2010. It appears that Jorge Iglesias will also be obtaining new counsel before that time. To some people, a tax deduction for pet care may not seem very important compared to many of the other issues our federal government is dealing with these days. But for 71.4 million American households that own pets, and for the 3-4 million animals euthanized in shelters each year, it's a question of life and death. Our struggling economy has seen a spike in animals being relinquished to shelters when owners can no longer afford their care. 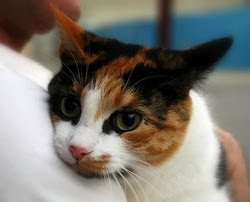 Veterinary offices, like most other businesses, have also seen a drop in client visits, which means that many animals may not be getting the care they need. If people knew the money they spent on their pets could be coming back to them at the end of the year, it might help them keep their four-legged family members, and to keep up with their care. A pet care tax deduction could save pets' lives and reduce the societal costs of sheltering homeless animals. Don't let the HAPPY Act (Humanity and Pets Partnership through the Years) fall off Congress' agenda - write your representative today! CLICK HERE TO TELL YOUR REPS TO VOTE "YES" ON THE HAPPY ACT! It’s time to help our Kibble on Wheels friends! During these challenging economic times, Independent Living, Inc. wants to assist as many low-income, frail, older and disabled adults and their companion animals as possible. We’ve learned the items listed below are what they most need and want. Our Kibble on Wheels program was begun to reduce food sharing between older adults and their companion animals. Season of Suppers, sponsored by Banfield Pet Hospitals, has allowed us to expand the program and with your help, we can provide a variety of items and supplies to make life happier for older adults and their animal friends. This is a great activity to get friends, family and other pet lovers together and hold a collection drive. For more details, contact us at (608) 274-7900 or volunteer@indepenliving.com. Kibble on Wheels is made possible by Independent Living’s partnerships with Mounds Pet Food Warehouse, Dane County Humane Society and Banfield Pet Hospitals. Independent Living Inc. is a non-profit, multi-service agency that assists people with disabilities and older adults, enabling them to live with dignity and independence while maintaining health and well-being. Submissions needed for Pet of the Week! On a regular basis, I will be randomly selecting a featured pet from Pet of the Week and their owner will receive a fun gift from the Mad About Pets shop! 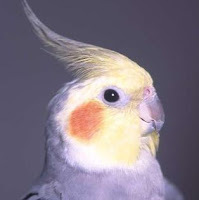 Yummy Recipe for Cockatiel Treats! Mix dry ingredients in order. You can add anything else that your bird loves. It should mix very easy. I crushed everything, but you can according to your bird size. Fold in the applesause and peanut butter. It should end up like a paste. Cook in a square pan, (easier to cut later than a circle pan), at 350 F for 30 min. It smells bad when cooking, but the birds love it. Thanks to Debra at BirdsnWays for this recipe! If you're looking to set up a fishbowl for your new goldfish or just need a refresher on aquarium care, here is a great how-to video from Dr.'s Foster and Smith. It includes lots of useful info on cleaning and general care for freshwater fish. Enjoy! Congratulations to Cheryl from Bronston, KY for winning the Pet Organizer! Many thanks to all the entrants, and I hope you'll continue to visit Mad About Pets. Enter to win a Pet Organizer! Just in time for the holidays, Mad About Pets is holding a giveaway! Up for grabs is a super-cool Pet Organizer, courtesy of Knock Knock Gifts. This organizer (a $26 value)is literally everything you need to keep all your pet's important info at your fingertips. It includes emergency contact info, vital pet stats, tracks vet visits, and so much more! You'll never need to worry about giving enough directions when you leave your pet for vacation, or about forgetting important details during emergency vet visits. 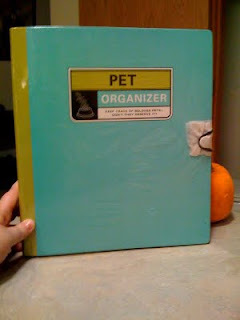 **Become a fan of Mad About Pets on Facebook and post this message to the wall: "I want to win the Pet Organizer!" Enter one or both ways!! Contest deadline is Sunday, December 13, 2009. I will randomly select a winner from all wall posts and retweets received.